L.A.’s Own: The Runnin’ Rebels. So last night I finally watched the HBO Documentary, Runnin’ Rebels of UNLV. This sugar-coated, sepia-toned, heart string-tugging documentary was a one-sided affair – much like most of the UNLV games in the early 90’s. For my family, this was a special time and a special city. Though we are L.A. natives, I’ve always considered Vegas a second home. My father, The Count, and his brother, Art, were boxing managers (Mia St. John, Otis Pimpleton) in the 80’s, thus we were taking road trips multiple times per year – and that’s where the Rebs came in, at least for me. With 80’s Vegas NOT being the family-friendly town that it was now, it was either playing more rinkydink games at Circus Circus or hanging around Thomas & Mack. Luckily, that was the era of Showtime in L.A., so I was well-versed on this new-fangled college version featuring Stacey Augmon, Greg Anthony, Anderson Hunt & of course ‘Grandmama’ Larry Johnson. 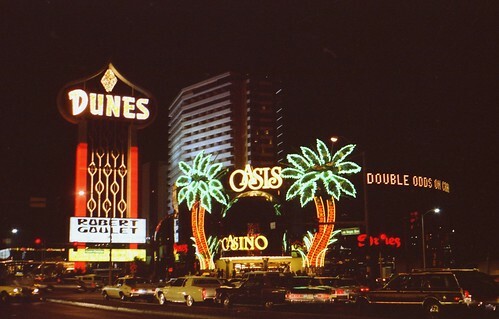 Another really interesting aspect of the documentary is the visual aspects of Las Vegas in the 1980’s, when Atlantic City was cutting into profit, tourism and cachet. It’s almost unbelievable in retrospect to think that there was not one new hotel built between the (original) MGM Grand in 1973 and the Mirage in 1989. The images of Vegas are so quaint, in retrospect. 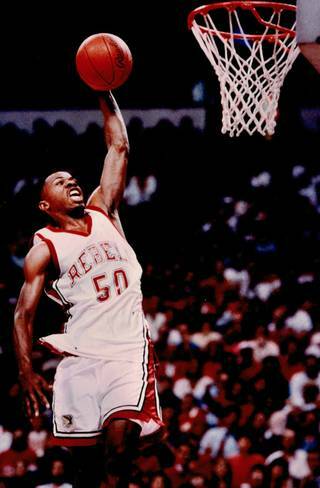 The Runnin’ Rebels of UNLV were not just a program. They were THE program, so entertaining, so dominant – so American. And there will not be another team like them, not with a run like that. Viva Tarkanian. Long live the Rebs. Is that Ackles in that last team pic on the far right? Literally took me back to jr high school! Great team! Fun to watch. Always exciting. Tark biting the towel when they were up by 20 points. Here’s Looking at You, Todd Fuller.